The sunshine, colour and commerce of Marrakech make it an exhilarating destination, but they can also make it a tiring one! Once you've been out in it for a couple of hours the sun may begin to feel relentless, and the crowds and dust of the medina are easy to become lost in. And of course it begins to feel as if everyone is trying to sell you something, because, well, everyone is trying to sell you something. But Marrakech has the perfect answer to the problem of Marrakech, a glorious tradition of pampering spa treatments - the hammam, or Turkish bath. And our guru's have selected the properties with the best hammams in Marrakech for you. then you're coated in Ghassoul, which is a natural mineral clay found in the nearby Atlas Mountains, before being rinsed over. Now that your skin is feeling all soft and you're all relaxed you might want to opt for a massage. There are public, or local hammams, - and most locals go at least once a week - but there are also private hammams, which offer a range of experiences more like the spas back home. And many of our favourite hotels in Marrakech have a hammam for their guests. So it follows that when you're choosing where to stay here it pays to stay somewhere with a great hammam. It's definitely the key to stay refreshed and relaxed on your Marrakech adventures. And even if you're not staying somewhere known for having a hammam, many places welcome non-guests in for treatments as well. Each hotel and riad will offer their own hammam experience, ranging from the basic, as described above, to versions involving soaking, showering and possibly even rose petals. And apart from the feeling of being all brand new afterwards, one of the nicest things about choosing a riad with a hammam in Marrakech is that they're often very beautiful parts of the building. 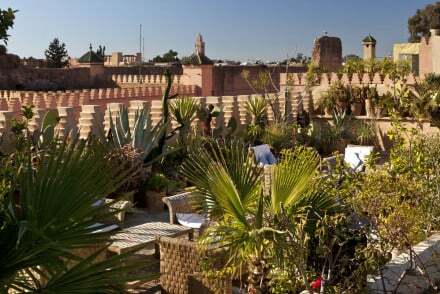 Traditional, but with everything a European guest could want, Dar Les Cigognes has a boutique hotel feels to it, with individually decorated rooms spread between two riads. Very well located for the Saadian Tombs, Badi Palace and the Bahia Palace, Dar Les Cigongnes also has an award willing cooking school - and the excellent restaurant you would expect with it. And of course one of Marrakech's most spoiling hammams if you're looking for a spa style experience. 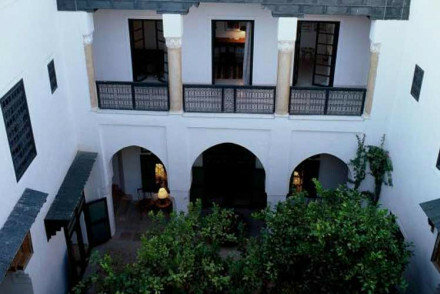 The Riad Kaiss has once a harem, so it's a great place to stay in you're looking for somewhere with a bit of history to it! It's been very elegantly converted, but many of the most beautiful original features have been kept, including some beautiful tiling and latticework. The central courtyard is a relaxing green haven, perfect for relaxing in post hammam. Or you can arrange to have a massage poolside. You don't need to break the bank to experience the hammams in Marrakech. Many of our favourite properties are accessible even to those on tight budgets. Riyad el Cadi is a well priced riad with a great hammam. Here, as well as the hammam, and the option to have further spa style treatments in the comfort of your room, there's a glorious sun terrace, and plenty of fine antiques and ceramics to entertain your eyes while you relax. Stylish and simple, this place has the air of a calm oasis - starting form just £100 per night. The following would be our pick of the hammams in Marrakech which also happen to be located within some of the grandest riads in town! Not all dars and riads are in the centre of town, and Dar Ayniwen is a fine, and spacious, example of the benefits of the ones which aren't. Set on five green acres in the Palmeraie area, this dar has room for a large outdoor pool and giant tiled bathrooms - some of the suites even have their own jacuzzi. So, as you can imagine from all these watery relaxation aids, there's room for one of Marrakech's most indulgent hammams. If you'd prefer to try a more traditional looking hammam, Riad Farnatchi has one in creamy white marble, lit by candles. And the welcoming pool has some beautifully detailed tiling. With only five suites in this luxury hotel, you can guarantee personalised service. And apparently the massages are 'knock out'. Villa des Orangers is a charming mix of French and Moroccan decoration and detailing. The inner courtyards are cool and welcoming, there are two pools - one on the roof terrace, and the hammam is luxurious. They've all the polish you'd expect from a top class hotel but housed within a traditional Moroccan home. 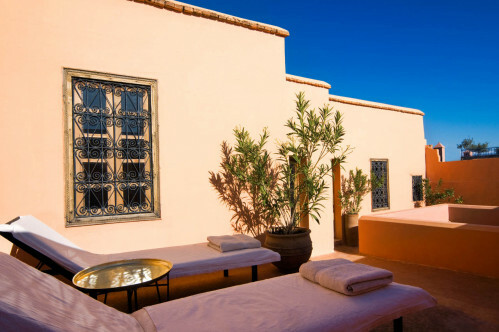 This villa is geared up to pamper, so they have one of the best spa and hammam services in Marrakech. All the scrubbing a hammam entails definitely isn't for everyone - and certainly not for everyday! But the marriage of hot and dusty Marrakech and spa accommodation is still a very sound combination. So many of Marrakech's best modern resort style accommodation also offer excellent spa facilities. Dar Zemora is a little out of town, but not as far out as it feels once you enter its lush gardens filled with lemon and olive trees and roses. It feels like a luxurious country house escape. There are two suites and three bedrooms in the main house, and then a suite by the heated pool and a two bedroom villa in the garden. The excellent spa is much more along the lines of what you'll find in country house hotels in Europe. 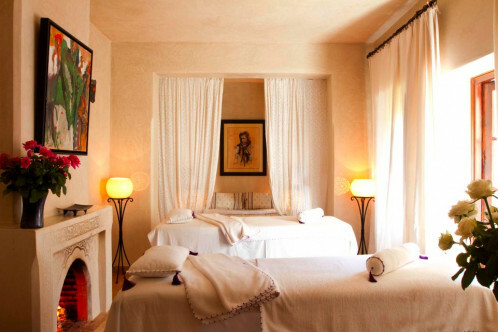 What could be more luxurious than a Moorish palace spa break in Marrakech? 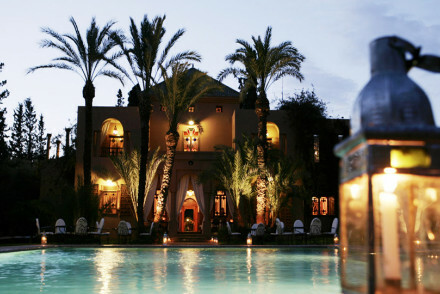 And, as well as being designed around the Moorish palace image, Ksar Char Bagh has the long, shimmering, palm tree lined pool and wonderful spa you'd expect of a palace - as well as one of the best hammams in Marrakech. The building looks ancient but it's new - so you have every modern convenience, as well as opulent older ones. When the weather is particularly hot you're welcome to dine with your feet in the pool's shallow end! For the real thing when it comes to royal palaces, Mosaic Palais Aziza is owned by a Saudi prince, who lives opposite this romantic, secluded hotel. This is a place to relax - and despite the obvious luxury it's unfussy and peaceful. The pool is large enough, and has enough private pockets so that couples will feel like they're the only ones here. 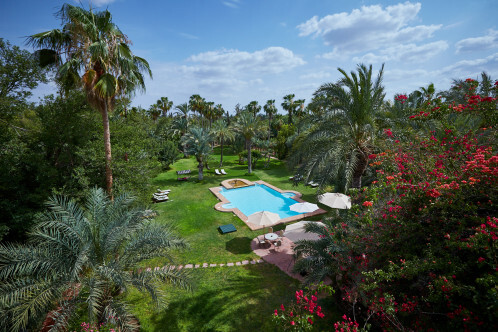 Mosaic Palais Aziza is ten minutes drive from the medina, but it's tranquil, lush and green, and with the luxurious pool, spa and hammam, and the choice of two restaurants on site, this is the perfect place to come to relax. 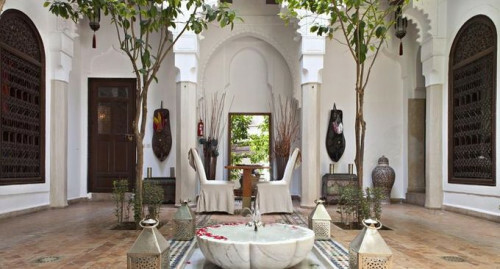 Magnificent, traditional riad in the Medina with easy access to the historic sites. Stunning rooms with exquisite touches, sun-drenched roof-tops, peace, calm and beauty. An elegant luxury riad right in the heart of Marrakech. The chic airy suites feel spoiling and romantic, with private balconies, Egyptian cotton sheets and handmade furnishings. Traditional white marble hammam is an ideal way to unwind after a day in the Souks. A really exquisite and intimate spot. Local markets - Just ten mins from Jemaâ El Fna Square. Cooking classes - There are a whole range of classes available from extensive courses to a day in the market followed by learning a dish or two. Great walks - Guided tours to help you uncover the history of Marrakech, get your bearings in the souks or even find the perfect carpet. Smart French-owned hotel with authentic Moroccan decoration. Sophisticated rooms with rich Moroccan-style wooden furnishings, beautiful and luxurious hammam, and inner courtyards for relaxing. A destination for wellbeing and pampering. Great walks - Wander around the Djemaa el Fna bursting with fire breathers, snake charmers, belly dancers and street vendors. Spa breaks - The lavish spa treatments are professional and totally spoiling, nevermind the Hamamm and multipile pools. City Style - An elegant Riad, minutes from the main attractions, with an exclusive feel and first rate amenities. A beautiful Moorish palace, in the Palmeraie scrub-land. The elegant suites marry phenomenal attention to detail with Moroccan chic and European style. The tranquil gardens, luxurious hammam and mouthwatering cuisine make this a fairy-tale honeymoon retreat you'll never want to leave. Honeymoons - A private a and tranquil palace, with romantic suites, candlelight dinners and plenty of grounds to explore. Spa breaks - A wonderful hammam for the unique spa experience. A romantic, secluded hotel that’s ideal for couples who want to steer clear of the chaotic Medina. 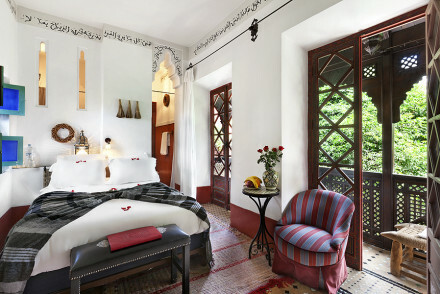 Luxurious, yet charming, this retreat offers a fusion of contemporary comforts and traditional Moroccan décor. The pool, spa & two on-site restaurants offer the perfect spot for ultimate relaxation.